on May 25, 2018 the General Data Protection Regulation (GDPR) came into force. Under the GDPR act EU citizens got the power to control the personal information they wish to share online. 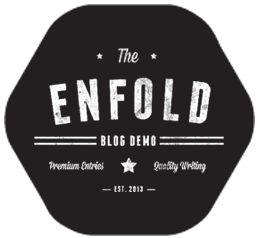 To know more on how Enfold theme is GDPR Compliant please check the GDPR blog post. A cookie consent message bar appears at the bottom of the page and displays a message to the web site user about the cookies. How to style the cookie consent message bar? To style your Cookie consent message bar, go to Enfold options > Advanced styling and select the Cookie Consent Message Bar from the drop-down list. Did you know that you can link the GDPR modal window to a custom button? You can then display the GDPR button anywhere on the site using a shortcode. Here the users can enable and disable any of the GDPR options as seen in the below screenshot. 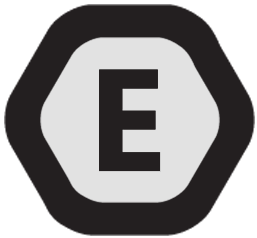 You need to download and install the Enfold Privacy Addon plugin. After the plugin is activated you will notice the extra options at the bottom of the Privacy and Cookies tab in Enfold theme options. Here go ahead and check the options “Activate the shortcode” before saving your settings. 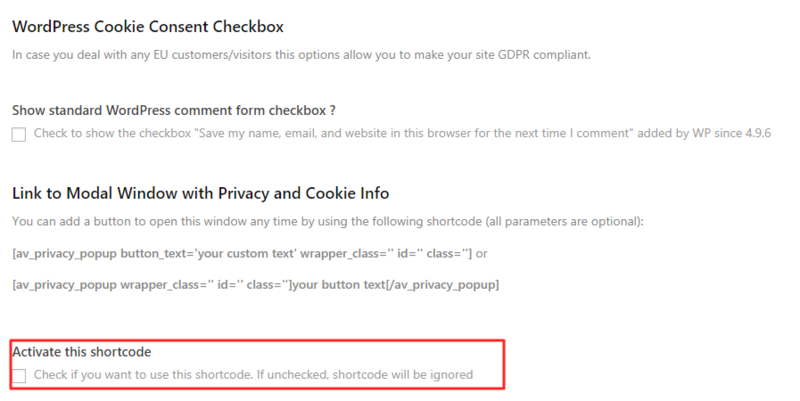 Lastly, just copy the shortcode provided here to your page or post where you want to display a button that opens the GDPR options in a modal window. Can users update the cookie settings? 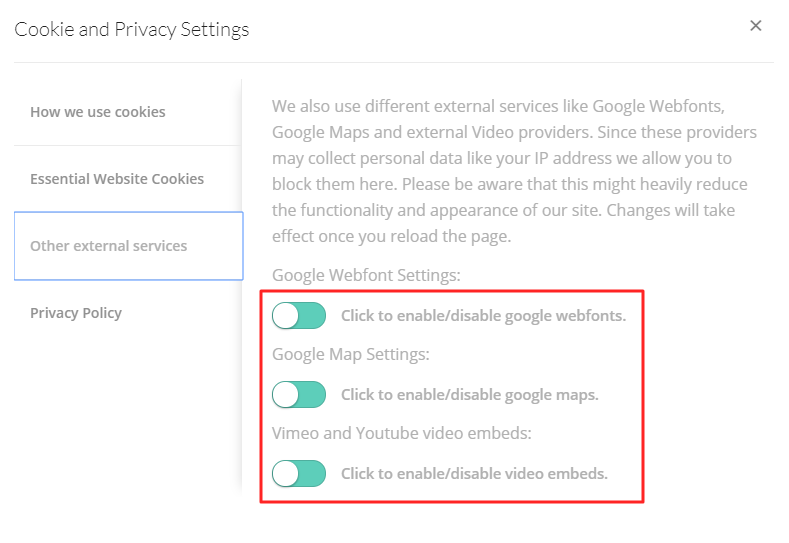 If you are looking for a way to provide your users with an option to select the cookie options then yes it is possible with the shortcode list provided in Enfold Options > Privacy and Cookie. Copy the below shortcode on to your site where you like to display the cookie consent option. Preferably, you can add it to your privacy page.